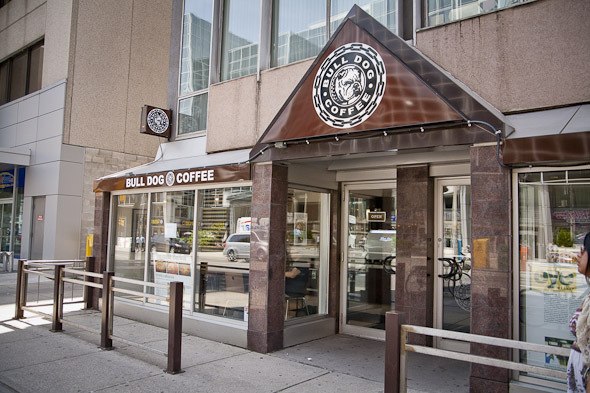 Bulldog Coffee (Eglinton) is the second incarnation of Stuart Ross's original Bulldog Coffee on Granby off of Church. The downtown Bulldog and I became great friends during my four-year stint at Ryerson University (just a few blocks down the road) so I was keen to check out this new cafe to see if it would jive with my post-grad life. On Eglinton east of Yonge, this new Bulldog is distinct from the original foremost in visibility. Whereas Bulldog Granby is sort of modest and off the beaten path, this new café has a sprawling storefront, complete with blown-up reviews of the original space displayed proudly in the window. Is it to entice new skeptical mid-towners, wary of Bulldog's less-than-friendly reputation? "Actually," the barista tells me from behind the counter, "we've been getting a lot of comments about how nice everyone here has been. I think it's improving." Bulldog, is that you? 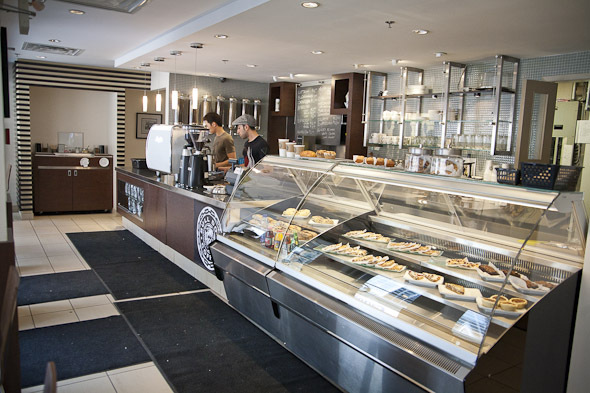 Actually, everything else here at Bulldog Eglinton, from the coffee menu to the baked goods and overall ambiance is true to the original. "Right now, everything is pretty much the same," the barista, Bruce, says. "We might add some things later on, but right now we're going to see how it goes." Stuart isn't at the café when I drop by, but Bruce tells me the idea was just to expand coffee culture further north and continue serving good quality coffee. "We opened about a month ago," he says, "and so far, things have been going really well." The space feels much roomier than Bulldog Granby with tables on either side of the bar and a patio waiting for a permit. 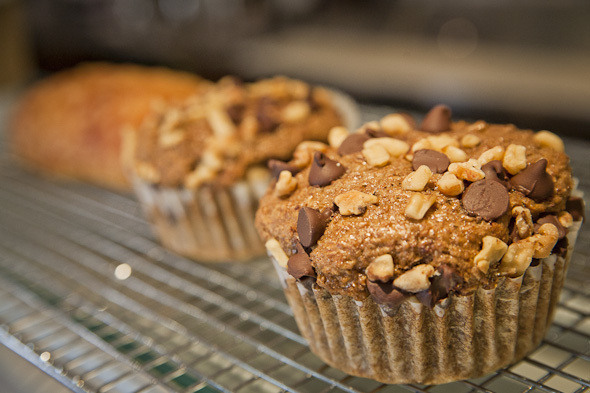 The coffee is the same seven-bean signature blend you'll find downtown, and the cookies, squares, muffins, and other baked goods are all made here on-site. 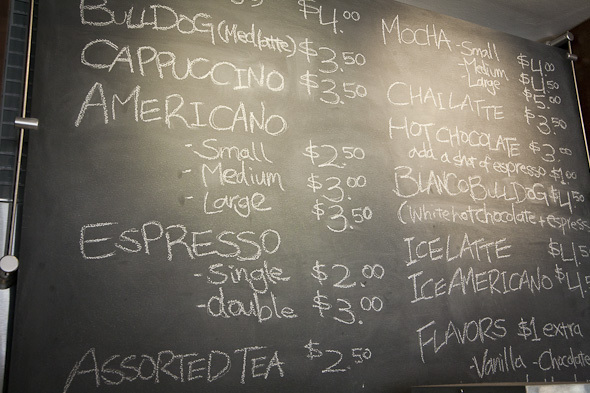 I scan the familiar menu of espresso drinks, and though it's been a while since I've laid eyes on Bulldog's famed latte art, the humidity compels me to order an iced Americano ($4.50). That great, rich taste that is distinctly Bulldog fills my palate, which unfortunately stirs up old anxieties of trudging away through endless essays and papers. After reminding myself that those days are (thankfully) over, I enjoy my drink--and yes--even the pleasant service. 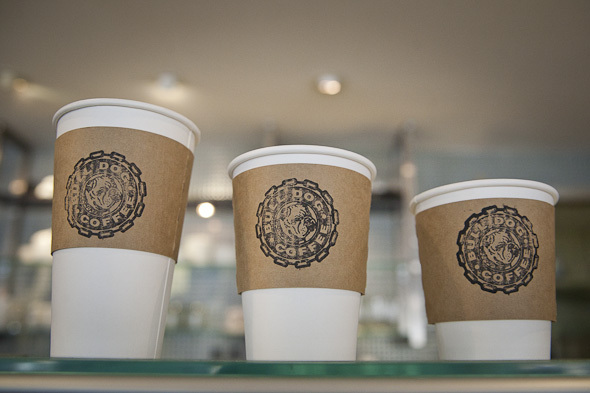 Bulldog Coffee (Eglinton) is open Monday to Friday 7 a.m. to 7 p.m., and Saturday and Sunday 10 a.m. to 7 p.m.